In the communities I grew up in Sikh woman take very active roles within the community. Many of the woman coming from a western background made a point to get involved equally (or more) than their male counterparts. I think having grown up in western society there was the drive for equality for woman’s rights. Siri Singh Sahib Harbhajan Singh Khalsa Yogi ji was instrumental in teaching and guiding the Sikh woman in our communities. He was a champion of women’s rights, and believed that it is women who are the backbone of society, and since 1972 when he inaugurated the first of annual ‘Khalsa Woman’s Training Camp’, he taught technology to turn ‘chicks into eagles.‘ which has been going since then and still is happening today. (You can buy some of the KWTC books/lectures here or read a few online) In a world where woman are still not treated well, or even close to equals, it is important that woman (and men) join together to help make changes in society, in their homes and families. Many of you have heard about issues of Sikh woman not being allowed to do Gurbani Kirtan in Harmandir Sahib or do certain sevas. One of the other things which to me seems like another ‘no-brainer’ is Panj Piare. Growing up, I have always been used to woman being a part of the Panj Piaray…but as I went to India and traveled around I never saw woman (outside of my community) representing the Panj Piaray. I didn’t really notice anything or think of it till I posted some pictures from Vaisakhi here in Espanola when we had a Nagar Kirtan with the Panj Piaray. I got a few comments from people saying ‘There were no woman as the panj…so you can’t have woman in the panj’. I didn’t realize people had thought like this. I grew up learning about Sikhi as Genderless. I don’t recall Guru Gobind Singh saying, ‘If there are five MEN together then I will be present…’. I have always understood it as if there are ‘five Sikhs’… (whatever the gender) then Guru Gobind Singh is present. Somehow this understanding has slipped some people’s mind and they tend to look at things in a very narrow viewpoint. In any case I think this is one thing that should change. Sikhs need to stop descriminating against woman. Gender equality is such a core point of the Sikh way of life that it is absurd to see some things go on. I think these practiced are more cultural than faith based. I remember when Arjan (my wife) took Amrit some years ago at the Summer Solstice camp. It was such an inspiring day. I remember sitting in Gurdwara the morning after the Amrit Ceremony. At the end of the ceremony the huge door to the Gurdwara opens for the full morning Gurdwara and the sangat then got to see all the Sikhs who had just taken Amrit. They all sat there in peace with the Panj Piaray on the other side of the Guru Granth Sahib. I remember shedding tears of joy and emotion at the sight of them. My mother and father were part of the Panj Piaray so it was like a family thing. I always look forward to the mornings after people take Amrit and see the glow in their faces. This past Baisakhi the first Amrit Ceremony ever conducted in Eugene, Oregon took place, and three Sikhs took Amrit that morning. As is normally the case in our communities, the Panj Piaray was comprised of both Singhs and Singhnis (men and woman). Here are some beautiful pictures taken by Ravitej Singh Khalsa from Eugene, Oregon – USA. I would rather say that Waheguruji & Guru Gobind Singh Sahib ji know the answer to this issue. I can only point is that when Guruji called for the heads when Khalsa Ji was born – men came and offered theirs- the Panj Paires. But it was Mata Sahib Deva (after taking Amrit – Mata Sahib Kaur) who added patase (sugar) to the Amrit which was been prepared by Guruji. I am not against women in this issue but the event points the answer to this. From my point of, I do not believe that women cannot take part, but when need arises they should take part in Panj Piarae. I almost felt like going up there an seconding him because they were about to shut him up and I was just about to get up and stand as his guard in between him and them. They dont like it because he revealed something that they wanted hidden. He told the Sangat about the Qurbanee of many people and how GuruJi should be regarded as your life and not just something in your life. Everything he said I always thought. So people called him a radical but I call him fundamental. He only said what the Gurus have said nothing more and nothing less. I respect that man for his courage to stand for Dharma to the corrupt Sangat members. He helped strenghthen my opinions and Im glad to have stayed that extra ten min. If I would have went to eat Langar I would have missed his truths, and to me I would considered it devastating. MataJi took part of the Amrit and GuruJi allowed her to place the sweetness in it for both Panjis and Gurus Amrit. So in reality a woman did stand up and give her sweetness into the Amrit and if she didnt the Amrit bani would just be water. Im thankful she put the sugar cakes into the Amrit bani. If you are more human than women then I guess you should allow women the be Pyare but who is more human than human? PLease be a True Sikh and question everything you are doing and thinking to see if youve chosen things wisely and not just doing it because they think that way or everyone else does.I could go on for ever about this like the energizer bunny. So whos next to comment about this issue. Oh My Goodness, This a GARAM MASALA (Hot issue) issue in which Bhenjis, Veerjis should take part yet until now I only see 2 comments. Where have all gone to….. If Veer Gurumustuk Singh writes anything which touches 3H0, Yoga….., then there are alot of comments either pro or-cons. Example “One of those days” – 41 comments. This Panj Piare issue is very significant and important issue to the SIKH WORLD, please express your thoughts and feelings. Don’t be scared,scared… Hope something will come up and keep moving. Thank You. Well put Guru Mustuk Singh! I also enjoyed reading Harpal Singh and Pritam Singh’s comments. I especially liked hearing that Pritam Singh would have stood up to guard the Nihung man if people had tried to stop him form speaking the truth!. That’s true Khalsa spirit! I think these things are the most important things to do with the Khalsa Panth in this day and age. I hold my Sikh principals to the highest esteem and would give up everything I have for it. The more I learn the more I become. And I have my whole life to learn so whats at the end? I made a mistake on the above post I forgot a “nt” which needs to be there so I dont say the wrong thing. If you are more human than women then I guess you shouldNT allow women the be Pyare, but who is more human than human? There my key board buttons have to be pressed hard or I forget some letters. When my daughter is taking a nap I try to type quitely but miss letters when I do. I like to think of the absence of comments as agreement from all the readers. Hello, I am from Vancouver, Canada, and I would like to say, that I am overjoyed that Sikhism has spread to people who are not from punjab or have ties to punjab. This truley brings joy to my heart. Sikhism is a faith for men and women, from the beginning our gurus have always told us that women are our equals. Now when Guru Gobind Singh Sahib ji asked for 5 heads, men only got up. Now Guru ji only asked for his Sikhs not men, and we must remember what age and time that was, even though Guru ji was ahead of his time the population was not, women at that time were still repressed by men it was not by Guru ji or Sikhism but by Punjabi Culture It is very important to understand that punjabi culture and sikh culture are 2 different things, Our Gurus were trying to get people out of the old ways (Punjabi Culture) and into sikhi culutre. Our Guru’s created the most wonderful faith in the world for both men and women, and now in this age and time I firmly believe women can become one of the Panj Paires. These women Gursikhs have given there head to dashmesh Pita ji, just like the men who have now, and thus are entitled to do any Sikhism rite. 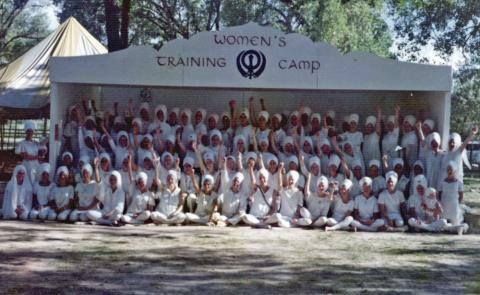 Another thing is that Khalsa we are “saint solders” but saint first, many Sikhs around the world hold views that are not totally Sikh but still are good Sikhs, what we need to do as a faith and people is we need to help them understand first with love not abuse like saying that men who think that women cant be in amrit ceremony are stupid. How will we as a people or faith ever help them realize there mistake, if we pick up our swords before we open our hearts. From my experience when one opens their heart and explains, that illuminates to the other person, and changes them, maybe not that moment but over time because you have left an impression and it makes the other person think. When I read this post, I was so proud of Guru Mustuk. I love that he fearlessly displays his truth to the Sangat. Yet, I have to say when I got to the end, and read that there were pictures, I said to myself, ‘I bet someone will make a comment under the pictures that says women should not be part of the panj’. Sure enough, someone has already made that comment. To keep from crying, you just have to laugh at this absurdity. Way to go Guru Mustuk! Also, thank you for posting the link to SikhWomen.com. In January, I encountered someone who told me that he didn’t think women should be part of the panj because no women volunteered in 1699. I like the response found on SikhWomen.com, and I will certainly use it when I see that person again. Before you post a comment. Stop and take a minute before reacting to comments. Ask yourself what purpose will your comment provide. Does it serve to educate and uplift others, or are you just reacting and arguing? Let us keep these comments civil and positive and not get into arguments. It’s easy to read something and just fire off a reply which becomes a fight. We may not all agree with eachother but let’s keep things civil and productive. You must post valid name and contact information. If you are going to write a comment then at least have the courage to show who you are, rather than hiding behind ‘Anonymous’ and entering in fake info. Comments that fall outside of this will not be approved. I posted these pictures, thoughts and words with the hope to inspire and share with others the beauty of taking Amrit. I feel that these days many people make ‘taking Amrit’ and ‘being amritdhari’ into a big thing about ‘rules and regulations’ rather than being a spiritual and disciplined person. I think many people are intimidated to take Amrit because of this. People don’t want to do it because ‘I might not follow the rules’ or ‘people will judge me’. I feel that many of our practices/Marayadas in Sikhi are not hardfast rules. It’s not like if you don’t do one of them that you are going to hell. To me they are guidelines to help us all stay on track and give direction for people. I have said this too many times already on my blog, but we have to stop all this critical judgement of others. One persons way is not the only or ‘the right’ way. Make an effort to see the good that people are trying to do and stop picking at what you think is wrong. This type of thing will be the downfall of Sikhi and is what I feel is pusing people away from Sikhi. Who wants to be a part of a religion where on all sides people judge you, tell you what you are doing wrong, criticize you, etc. Why not the loving embrace and acceptance to all. Where is the Spirit of Guru Nanak who said ‘I am not hindu or muslim’ and who preached about openness and acceptance of all? So with these words I hope you all will think a bit about all this and use this as a learning experience so that we can further uplift and share the beauty of Amrit with all. The definition of stupid: 1} Slow to learn or understand; obtuse. 2} Tending to make poor decisions or careless mistakes. Stupid doesnt mean I will literally strike you for your opinion, but it means you are slow to learn. True statement from Khalsa Sahib, â€œA barber volunteered to be a pnaj in 1699, thus every panj must contain a barber.â€? Slow to learn or understand; obtuse. Im not striking anyone, just reminding some what Khalsa means. Any real Khalsa can be one of the Panj Pyare. Khalsa = Pure not males. I’m a university student in Ontario, Canada and have always been raised to beleive that Sikhi is genderless, from my parents, family and the sangat that I had been surrounded with. The question of whether or not women could be a part of the panj piyare was never an issue, or a thought that had even crossed my mind. It was a no brainer. Yet, only a few months ago, when a few university kids got together (as we do twice a week to do rehraas and discuss sikhi related issues with the Sikh Student Association) this question was raised. As I was not able to make it to the meeting, my friend was updating me on what was said. She said, ‘Someone asked the question of whether or not the group thinks that women should be a part of the panj piyare’. I looked at her and said, ‘Well, that must have been a boring discussion, what was there to talk about? Everyone must have said ‘yes’ and moved on.’ But to my surprise, it was a heated discussion. I was dumbstruck! These are not youth who have been born or raised in India. These are the youth which have been raised right here in Toronto their entire lives. I could not believe what I was hearing! The excuses given included the typical (the original panj were all males) and also excuses such as, ‘The woman’s role is to be a mother, and that is much more important than being a part of the panj piyare.. or… Things have always been like this, why try to change them now if no one is complaining?’ I simply could not believe what my ears were hearing. Yes, women have taken on the very important role of being a mother, but since when has that taken precedence over their own spiritual path? I do not recall the women under the tyranny of Mir Mannu giving up their Sikhi to save their children, instead, the children were sacrificed while the women stayed steadfast to their beliefs. This was not the only thing that had shocked me, but the worst part was, my fellow kaurs did not speak up. Instead, they agreed with what a few singhs were saying. I felt like I had been slapped in the face! While a lot of progress has been made regarding the equality of women, apparently, we’ve still got some work to do. I hope some day that these kaurs realize the strength they have within and that they have the power to change the ignorant minds of many and that they CAN take a leading role in the Khalsa Panth. Gurumustuk Singh ji – many years ago when we lived in Houston I was blessed to be part of a Panj Piare in the first-ever Amrit ceremony held at that sangat. And of course, as you well know, not only your own mataji, but GuruSangat Kaur of VA (mataji of SadaSatSimran Singh of Cherdi Kalaa Jatha :-) ) has often been a member of Panj Piares at Summer Solstice and other venues, as have other women of the western Dharma. We, as western women, must continue the movement to enlighten the sangat on the rights of women to participate fully in the activities of the Dharma as Khalsa, and not let ourselves be shut out because of our gender. The idea that women cannot or should not participate in the Panj because only men were in the original Panj is very archaic and analogous to the Catholic Church’s position that only men can be priests or serve the Church because Jesus’s original disciples were men, no women. Let us not also use such spurious reasoning! Thanks for posting Gurumustuk Ji! This is great discussion and should be taking place in every Gurdwara, home, blog, and lecture hall. Sometimes, it is hard to believe how fanaticism, chauvinism tries to slowly creep into the progressive Sikh society. Here is one of my exepriences; One day I went to attend a wedding at our local Gurdwara here and I took off shoes in an area I thought was for shoes for anybody. Afterwards, I realized that Gurwara management had designated separate shoes areas for men and women. That was the first gurdwara I had visited in my life of 40 years where men and women shoes were kept separate. Now, growing up in Punjab and other places have also seen many many times, men, women and children sitting together at Akhand Paths, funerals, bhogs etc. and I even wonder about the beginning of this tradition of men and women sitting separately in gurdwaras. If men, women and children can sit together during Akhand Paths, bhogs, kirtans and langars at home together, then why not at Gurughars? Nobody here can prove that women were not part of the Panj in history and it is true that women were. I have had the blessing of learning from a super wise gyani GurSikh who has had access to well-guarded scripts and historical accounts. In the future he may be able to take some pictures of these historic texts. When I discussed this issue with him, he began listing women in history who were part of the Panj. The only name I remember was our beloved Mai Bhago. And why not? She was Guru Gobind Singh’s body guard and the leader of her village, it only makes sense she also administered amrit. There is no gender in Khalsa, prove that there is. There are historic Sikh women in the panj, prove that there isn’t. No need to be polite with hardliners any more. People like to believe hardliners because they can yell the loudest. People will succumb to cultural norms because it’s convenient. Who instituted these cultural ‘norms?’ When were women subjugated? Certainly NOT in the court of the Guru. When was the caste system allowed amongst Sikhs? When did yoga become bad? jog jugat sun aa-i-o gur tay. I came to the Guru, to learn the Way of Yoga. jis kai antar saach vasaavai. When did it become appropriate for Sikhs to criticize each other? When did the students of the humble divine, perfect, jeevan mukti Guru Nanak, decide they know better than others? When did bana, bani, seva, and simran, take a backseat to critcism, slander, judgement, politicing, abuse….? The list goes on to the number of avguns that we each have within ourselves. This comment is just in response to what people spend their time writing about on the internet, including this blog, but surprisingly not under this topic. May we all try to live in the spirit of the One God that resides within each of us. What is right is what God does, everything. Sat Naam, Siri WaheGuru! I would like to say that i am dissapointed with some ppl who think that women can’t be involved in the amrit cermony just because no women went up in 1699. Times have changed and it’s time to make sikhi truly equal. Wow Manjit that is a new one for me. Ive never heard of that. I would take 10 pairs of shoes and place them their just to show the management that we dont melt or the praising of Waheguru doesnt stop. Their are alot of little things like this that really add up and it throws off everything. Very interesting that you brought this up. Tanveer Kaur….. you should bring it back up at your next gathering so the men you gather with at your meetings can here the whole story. I am just not the right guy to speak up since I have a reputation at home of speaking not kindly and may make situation even worse. But this Fremont Gurdwara is the only one I know in the area. I haven’t visited the Hayward, or the newly built one in San Jose yet. May be one day I will write to them about the issue which works better for me. May be management does not even know that it is an issue for some people unless it is brought to their attention. Tanveer Kaurt Ji – On being born in Canada and their views, this may sound way off but I would like to say is that some people (I want to emphasise this word “some” so as not to generalize), who moved from India seem to be stuck in the year that they moved out of India. What I mean is India progresses, Canada (or America or other country) progresses, but some of the people don’t progress in either of these countries and fail to move with time. It may not be their fault, but learning is a continual process no matter where you live on this earth. They may have raised families telling stories of India or Sikhi to their kids which are of their childhood times. I hope I am making sense, but I want to say is that some people just want to stay ignorant. I went to school with some people of Punjabi background in Canada which to me were more ignorant than even people in India or the other countries. On same note, some of the top scores and most honor students were also from Punjabi/Sikh/Canadians. Someone made a great comment about Sikhi spreading outside Punjab/ India! I have been thinking about this for a while and I really think that Sikhism is in dire need of another Singh Sabha Movement to bring Sikh practices in line with SIkh teachings and teachings of Guru Sahib. There was NEVER and issue of what women can or cannot do during Guru’s times. If women could go out in the battlefield and fight along with guru’s sikhs, then how can guru deny them the right of being part of Panj Piyare or any other seva for that matter. Its the SIkhs who have fallen back into thousands of years old cultural, religious traditions of brahmin and started following it, forgetting what Guru told them in very clear terms (equality of women). The whole idea that Sikhs even have to debate on such an issue is ridiculous!! Sikhism does not promote castism but its Punjabi/ Indian sikhs fighting and building gurdwaras along caste names. Sikhism does not believe in fasting, but whole bunch of Punjabi/ Indian women do karvachauth’s and what not! Sikh’s guru is Guru Granth Sahib and they should follow it but most of the Sikhs would rather listen to some baba, sant of some particular dera than read gurbani and follow that. This whole thing is stupid and what’s worst is that even new generation of sikhs still carry on that baggage from their parents even if they were born or raised outside India. The nearest, please refer to Sikh Wiki Encylopedia-Mai Bhago. She only came into the picture later after “Birth of Khalsa” – in 40 Mukhtas case. I wanted to take the part and paste here but I did not – due copy writes. In Mukhtsar War, she was injured, Sahib Guru Gobind Singh took her with him, & later on followed Guruji until Nanded. She spent her last days a far away from Nanded- near a fort (still exists) on the way to Bidar. She lived up to the age of 90’s. Last year I visited this Gurdwara Sahib and in Nanded I have seen her things – her gun-about 15 feet long. She was a strong and tall lady. I felt very emotional seeing her sacrifice, at times there are tears in my eyes. As afar as Amrit is concerned only Waheguru knows and we can carry on assuming things. As I have said before, when need arises women should take part. Of course there will be alot of Ho Ha’s don’t bother of them. Seriously, why is this even a discussion? Women can’t be Panj Piyare? WTF? That’s like saying men can’t be Panj Piyare. Without women, where the heck are men? You did point out the but in reality who will follow what is written in black and white in Sri Guru Granth Sahibji. Today’s world, we want Guruji to follow our orders eg. Ardas- long live, must furfill wishes etc…., but not obey and follow what Guruji – the Bani say. bhoolee maalanee hai eaeo ||In this, you are mistaken, O gardener. Brahma is in the leaves, Vishnu is in the branches, and Shiva is in the flowers. The sculptor carves the stone and fashions it into an idol, placing his feet upon its chest. The gardener is mistaken, and the world is mistaken, but I am not mistaken. The shabad advises us not cut these plants, flowers and etc.. and offer for prayers and etc.. But do we follow. We have to ask ourselves are we Gurumukh- follow what Guruji say or Manmukh – follow what our mind says. We are good for Arguements, find faults etc….and everyone learned etc… thinks he is right. you can put 10 of theme, but they will never conclude or agree as one – each person will saying he is right-other is wrong,(even the Bani is translated to his version and needs, But not to the Black and white of GURUJI’s Bani). Due this scenario, I place my strong hopes and cling my love only To My 11 GURU SAHIBJIS and WAHEGURU himself. Bani leads and advise me is more than enough to me. Wish You all the best. Thank You. Veerji Gurumustuk Singh, Sorry I have taken a long space for my comment. i was delighted to see the picture of panj piyare preparing AMRIT.SIKHI is spreading in the west and shrinking in the punjab. we should not be opposing sikhi thee chardikala but should be working for sikhi thee chardikala.people who oppose women in panj piyare need to look back into punjab and explain that.i,m from punjab and i know the facts. lets take this a bit further. In India ,as per the Hindu tradition girls are considered as “baigani”(belonging to another family). I have always found this to be a very stupid idea,. How can your child be someone else’s??? The sad part is that when these families move to western socities they still bring their old values with them. The result is that Sons are still considered as the heirs to their parents and can never do wrong in the eyes of their mothers. Sorry to say this but the biggest enemy of women is women themselves. If they could insist on bringing up all the kids equally maybe the values of these sikh boys would change, and the Kaurs would then be able to see the light as mentioned by Tanveer above. This discrimination extends to other religions too. Wow! This is so inspiring! Wish more Punjabi Sikh Women follow their footsteps; personally I can’t as I can’t ‘kanth’ Jaap Sahib. I have never seen any women participate as Panj Piyara in Amrit Sanchaar though many times sikh women have been in Panj Piyare in Nagar Kirtans. About 3-4 years ago, during Amrit Sanchaar Ceremony, a sikh sister was blessed with the Sewa of Granthi; It was a great honor! The only picture I took did not come out right :( In LA Grudwaras, woman take very active roles in running Sunday Schools; as compared to their male counterparts. Though I have never come across anyone who is opponent to women’s participation as Panj Piyare, but have not met many either who would encourage their sisters, mothers, wives or daughters to go far it. There is great need in punjabi Sikh community for both women and men to come together to help make changes in society, beginning from their own homes. You’re right Gurum. this is a stupid and backward load of nonsense. To suggest that the entire female population of the world is banned from being part of the panj because no woman stood up at that time is as irrational as saying we’re all sinners because of the actions of Adam and Eve. It’s not logical at all, Adam/Eve did not represent me (as far as I’m concerned) and the women who did not stand up do not represent other females either. What on earth would Guru Gobind Singh make of this? Men and women are equal in our faith, it’s as simple as that, and this debate along with all the other rubbish (eg. seva ban at Harmandir Sahib) is embarrassing. Any Sikh who is Amritdhari is an automatic candidate to be in a Panj. Simple as that. There is no possible argument that does not insult the very meaning of Khalsa. I cant resist commenting on one common argument though; for those who point out that no women came up in 1699, well nobody from Punjab did either. Both points are irrelevant. I wonder if there was any demarkation that was named Punjab in 1699. Was there? Anyone? You apparently either missed my point or disagree with it. If I missed your point, how would I be able to raise the question. And How do I agree or disagree with you if the very basis that your point says (Punjab) didnot exsist during 1699. I honestly put a question, which I donot know answer. By your question you seem to imply that it would matter whether the Panj Piaras were from Punjab or not. My point is that it matters no more than whether they happen to be male or femail. Bhai Daya Singh – Had been a Khatri of Village Dalla in Lahore. By todays demarcations none of those places are within “Punjab”. While at that time Lahor would have been considered part of it, certainly none of the others would have been. So, if one is to argue womens exclusion, better argue locals as well. Casts and professions too while you are at it. I don’t get it when people say there is no gender in sikhi? At weddings I see a Singh and a Singhnee and the singh walkin ahead of the singhnee. There are just some things that are teh way they are do not need to be changed. Why do we have to ‘keep up to date’ with the times. Women are equal with Men in the sikh religion, that is a no brainer..but at the same time should women wear cholas showing their legs? of course not. Is it wrong that men can bath in the open at harmindar sahib but women can’t? of course not. This has been practiced for the longest time. Guru Sahib still makes a distinction between men and women, I am pretty sure he does not consider them the exact same thing, but I know he does consider them equal. Bani makes many methaphorical references to the ‘bride pleasing her husband’.. so there is obvoiusly a clear distinction. I don’t know were im going with this but yea Panj Pyare should remain a seva for men. That is my opinion, and the opinion of many great gursikhs. It is sad that someone who thinks this way gets labelled as ‘stuck in cultural wrld of India/punjab’, or labelled as a women hater or chauvanist whatever ther called now. You can believe Panj Pyare is a seva for men, and still recognize the equality and great deeds of women in the panth..trust me it aint that far fetched i am proof of it. I would just like to back the Gursikh mothers of Guru Gobind Singh Ji’s time. Some people, very arrogantly said that the women of maharaj’s time were some how “less” than the “sikh woman” of. The difference with them and the “sikh women” of today is that they showed there love for Sikhi by not giving up there faith even when their children were cut limb by limb and placed around there necks not whining about it on internet forums. Now, how many of the “sikh woman” of TODAY out there can actually undergo that kind of torture…. probably 1 in 1000 Amritdhari Sikh woman could. There was a higher understanding of Sikhi in the Guru’s times, and there was true love, but as time went on people have gone back to their old ways… at it seems to be getting worse, we are in much more worse position as a kaum (Nation) than ever before. The Sikh mothers of Guru Ji’s times are 125000 times the Gursikh’s of you bibia who think they didnt have courage and could not stand up for themselves when needed. The fact is most women especially western still think a womans revolution is needed… that was finished by Guru Nanak Dev Ji Maharaj. You bibia are stuck in Western History, 30 years back. As for the Panj Pyareea issue, its pointless discussing that here as most people here do not have respect for maryada and really dont have the knowledge to be discussing this topic. If you want a answer that will help you then ask a person who has done a LOT of Kamaee ie Saint, who is actually in touch with Guru Granth Sahib Ji through all parts of their soul. Vaheguru Ji Ka Khalsa Vaheguru Ji Ki Fatheh. Thanks for the refresher on the Names and addresses of the Panj Piyaree. Based on the question I put (Punjab issue), how could one assume that I am anti women being in Panj. Your logic still makes no sense to me. By your countering my comment it might reasonably be assumed that your intent was to refute it. If that was not your intent perhaps you might have said so. Men and Women are certainly different in countless ways. In their identity as Khalsa there is however no difference. They are no less deserving than men of being recognized among five Sikhs of the Guru, or among any number. Guru Gobind Singh said where there are five of his Sikhs present he is there. He did not say five male Sikhs. The idea is absurd. Any man who tries to tell my 3 year old daughter otherwise will be in trouble. It has been said that the strength of a nation can be gauged by the strenght of its women. Lets make our nation strong. Great Bhai Sarib Singh jee… Next time before commenting to any post, I’ll explicitly state if I’m for or against what I’m commenting for. But I can support something and still not agree to the logic someone has behind it. These are two different points. There should not be two opinions about equal rights to women. When our Gurus said MANAS KEE JAT SABHE EKE PAHCHANBO…. Do they exclude women? The women were exploited, degraded in some other religions. Less or no knowledge of Gurbani took sikhs to act as others. Most of the the people (Leaders) at the helm of sikh affairs are occupying the seats by politically engraved powers. They have not time or desire to listen/learn from gurbani what Sikhi is. A strong wave is required to bring reforms in Gurdwara system unlike present the so called democratic system. To that effect, I would like to point out that we call our ladies Singhnis, not the independent name given to them Kaurs. This way by calling Kaurs as Singh-nis we are deriving them from Singhs. But the truth is that every Singh is derived from Kaur. Refer them as Singhs and Kaurs. Bhool chuk maaf karni ji. The assumption behind the argument that women cannot be a part of Panj Piyara is that women are not as courageous as men, because no woman stepped forward to sacrifice her head. The first question that follows is, can women from one time and place represent all women in all times and places? Secondly, every time a woman gives birth, she gives up her head, but it's such a regular occurrence, the courage required is easily overlooked by some men. finally, I think we all know where the women were on that day – they were in all likely-hood making lunch and doing the dishes while the men talked amongst themselves. YES, PANJ PYARA with women as acted in the west ,in America, as I have seen it ,….. is a beautiful and right thing . chanting WA HE GURU like a frenetic disco mania IS NOT going to help the credibility of the west into demonstrating its open mind .. :" implemanting women PANJ PYARA"
after that you can push your agenda . Otherwise ,you take the risk of looking CLOWNESQUE to the rest of the sikh world here and ESPECIALLY IN INDIA.